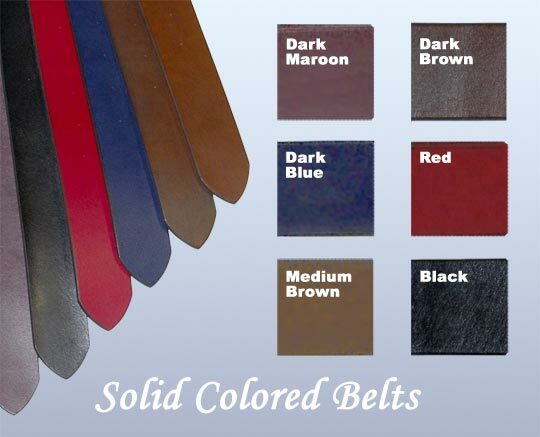 Custom-fit belt straps available in 4 widths, 6 plain colors and a selection of two-tone carved designs. Choose from a range of color, design, and width with the length custom fit to your size. Belt Strap Length: When measuring for belt length, first determine if the belt will sit at the true waist or further down on the hip. Use an old belt to determine size: measure from the hole commonly used to the far end of the buckle. All of our belts have 5 holes, punched 7/8 inch apart; the measurement you supply is placed at the middle hole. This allows for an adjustment either way. When ordering a belt for a buckle you already have, please contact us.